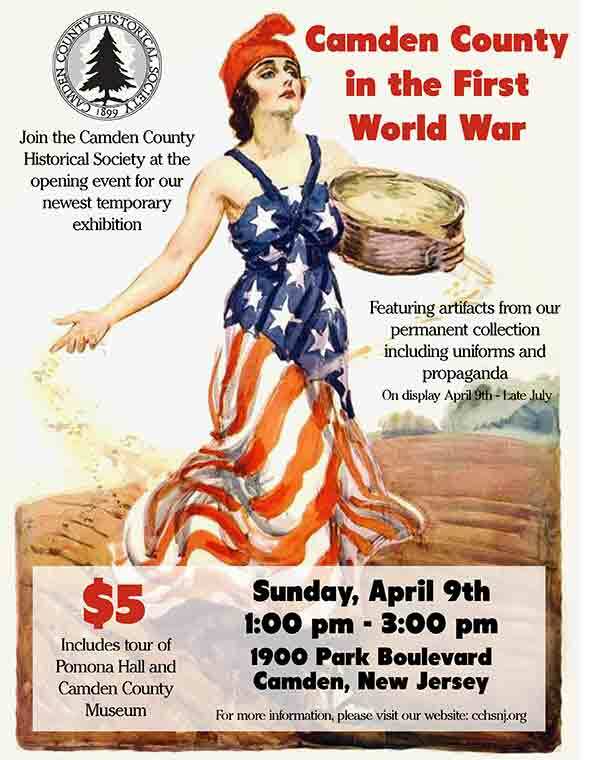 The Camden County Historical Society is excited to announce the opening of “Camden County in the First World War” museum exhibit on April 9th from 1-3pm, as 2017 marks the centennial of the United States joining the Allied forces in World War I. 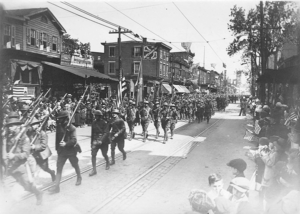 “Camden County in the First World War” will examine the changes that occurred in Camden County as industries switched to war production, people risked their lives to serve their country, and volunteers contributed their time and money to support our military from afar. This exhibit will feature a variety of objects from the Historical Society’s permanent collection that have not been recently displayed, including uniforms, service medals, propaganda posters, Red Cross drive materials, photographs, and more. Hundreds of veterans of the First World War, as well as 136 Camden County residents who lost their lives while in service, have been honored with local plaques and memorials across Camden County. The locations of these World War I memorials will be displayed on a thirteen-foot long map of Camden County. This map will constantly be updated during the year as the Camden County Historical Society learns about more World War I memorials located in schools, churches, and organizations throughout Camden County. If you know about a World War I memorial in your town, please contact us through our Facebook Page or call us at (856) 964-3333. The exhibit will open on April 9, 2017 and be open during our normal operating hours through late July. Admission is $5 for non-members and free for members. The Camden County Historical Society is located at 1900 Park Boulevard, Camden NJ 08103, and is open Wednesday to Friday from 10am to 4:30pm and Sunday 12-3pm. For more information, please call 856-964-3333, email admin@cchsnj.org, or visit our website at www.cchsnj.org.